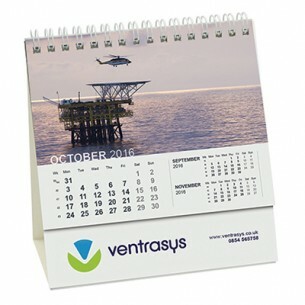 If your customers include office workers, provide them with this useful branded Smart Calendar - Compact Easel With Board Envelope so they can quickly check the dates. The calendar is shaped like an easel and sits flat on the desk, and the spiral makes changing the pages easy. Each item is provided in an envelope so it can easily be sent out via post to reach your customers and provide them with a free treat. We will print your branding using litho or digital printing. Print area 125 x 30mm.